For the Queensland electoral division, see Electoral district of Nanango. 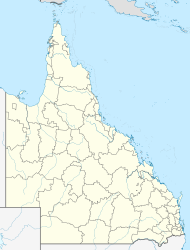 Nanango /nəˈnæŋɡoʊ/ is a town and locality in the South Burnett Region of Queensland, Australia. In the 2016 census, Nanango had a population of 3,599 people. Nanango is situated 190 kilometres (118 mi) north-west of the state capital, Brisbane. Nanango sits at the junction of the D'Aguilar and Burnett Highways. The original inhabitants of the area were the indigenous people belonging to the Wakka Wakka (or Waka Waka) people. The area was used as a gateway to the bunya nut festivals, where Aboriginal people would travel from as far away as the Clarence River in northern New South Wales and the Maranoa River to feast on bunya nuts from the bunya trees. The area around Nanango was first settled by Europeans in 1847 by John Borthwick and William Oliver from Ipswich taking up pastures for sheep farming. Oliver selected an area of more than 500 km² that comprised four blocks – Coolabunia, Booie, Broadwater and Nanango. The first commercial establishment at the present site of Nanango township was Goode's Inn, founded by prospector Jacob Goode in July 1848. The inn served travellers journeying from Brisbane and Limestone (now known as Ipswich) and became the meeting place for early residents of Taromeo, Tarong and Nanango stations. The town of Nanango quickly developed around it. Goode's original rough slab structure met the licensing conditions as his first licence for the "Burnett Hotel situated at Barambah Creek" was given at a special licensing meeting on 26 April 1849. Nanango claims to be the fourth oldest town in Queensland, but such claims depend on how the age of the town is determined. In some cases, this is by the first settlement (usually for pastoral purposes in or near the eventual town) or it might be date of survey for a town plan. Nanango's claim to be fourth oldest is based on the first establishment of commercial premises (e.g. store or hotel), which is Goode's Inn in 1848. On this basis, it is the fourth following Ipswich (then called Limestone), Drayton, and Maryborough. However, Nanango was not surveyed for a town until 1861, and several other towns were surveyed before that. Goode's Inn Post Office opened on 5 January 1852. It was renamed Burnett Inn by 1855 and Nanango on 1 July 1859. The name Nanango has evolved from the Wakka Wakka word "Nunangi". There is dispute over the origins of the name Nanango- the word means "large watering hole" or was also the name of a local Aboriginal elder at the time of settlement. The original settlement was called "Noogoonida" by the Aboriginals, meaning "place where the waters gather together". Beef, dairy and timber (in particular the valuable red cedar) were the primary early industries in the area. The discovery of gold at the Seven Mile Diggings near Nanango in 1867 precipitated a gold rush, and consequently a local population boom, however the gold deposits were found to be meagre. At one time the population included 700 miners, many of whom were Chinese. A second population boom occurred when the Brisbane Valley railway line was extended to Yarraman in 1911. Nanango became the terminus of a branch off the South Burnett railway line at Kingaroy on 13 November 1911. The 22.5 kilometres (14.0 mi) (14-mile) missing rail link between Nanango and Yarraman, although planned was never built. On 29 January 1920, the Nanango War Memorial was unveiled by Major-General Thomas William Glasgow. After World War I, however, growth levelled off until the early 1970s when the development of the Tarong Power Station led to a third population explosion. McCauley Weir was used as the town's water supply until three additional bores were drilled at the confluence of Barkers Creek and Meandu Creek. The Nanango Library opened in 1962. At the 2006 census, Nanango had a population of 3,083. 41 Albert Street: Ringsfield House, built by Robin Dods for Mrs Florence Graham in 1908. Grand country residence and gardens. The area has a similar climate to nearby Kingaroy, however it is described as cooler in winter and more humid. Nanango's principal industries are power generation and coal mining, agriculture, beef and pork production, dairying and milk processing, timber growing and milling, small crops, natural medicine, art and craftwork and tourism. Nanango has two primary schools being Nanango State Primary situated near Barkers creek and a Catholic school called St. Patricks. It also has the Nanango State High School which was established in 1982,and is set over 35 acres of land. The State High School, which has over 500 students and a special education unit (SEU), was previously situated on the same land as Nanango State Primary School. Nanango also has a vigorous cultural and sporting life and is host to several potteries, Art Gallery and many craft outlets. The town also has many clubs and a range of sporting facilities including an RSL, bike, darts, golf, lawn bowling and archery clubs. There are 13 well-maintained parklands in the Shire which naturalists believe are home to 250 different bird species. The South Burnett Regional Council operates a library in Nanango at 48 Drayton Street. It hosts events for children. The Nanango branch of the Queensland Country Women's Association meets at its hall at 59 Fitzroy Street. Located approximately 200 kilometres (120 mi) away from Brisbane, Nanango attracts day and weekend trippers from South East Queensland. Tourists also travel through the town on their way between Rockhampton in the north and Sydney/Melbourne in the south. The central business district features chainsaw sculptures and murals which reflect the town's historical connections with timber-felling, farming and mining. A great deal of Nanango's colourful history is preserved in its buildings – especially Ringsfield House, a restored circa 1908 Queenslander developed by architect Robin Dods. Unfortunately a number of fires throughout history have ravaged the CBD of the town, especially the fire of 1940 which destroyed all of the shops on the southern side of Drayton Street from Fitzroy to Henry Street. This has led the CBD to have a "1950s feel" due to the architecture of the time. One building that escaped the ravages of fire was "Nobby's Corner", an example of an old-fashioned corner store with wide verandahs. Nanango serves as a gateway for exploration of nearby towns. Day trips from the town include the Grapes and Gourmets Drive, Bunya Mountains, Coomba Falls and fossicking at Seven Mile Diggings. The "Great Bunya Drive" was created in 2006 and passes through the township and other regional attractions. The Nanango Country Markets are featured on the 1st Saturday of every month and are widely recognised as the largest rural markets in SE Queensland. They have on average over 400 stalls, and reportedly in December 2013 had over 800 stalls. Nanango has a range of accommodation for tourists, including caravan parks and motels. Nanango has a number of live entertainment venues which regularly host performances by local theatre and musical groups. The Lee Park race track – not far south of the CBD – hosts around 8 meetings each year. Major annual events include the international Criterium Bike Race (held in Nanango's CBD in February); the Nanango Show (held at the Nanango Showgrounds in April); Nanango Medieval Fest (fourth Saturday in August); Nanango Arts Fest (held over a week in October); the Nanango Country Music Muster (held at the Showgrounds in September); the week-long Mardi Gras (in October), and the Christmas Carnival (in December). ^ Australian Bureau of Statistics (31 October 2012). "Nanango". 2011 Census QuickStats. Retrieved 27 August 2016. ^ "Nanango - town (entry 23786)". Queensland Place Names. Queensland Government. Retrieved 27 August 2016. ^ "Nanango - locality (entry 49608)". Queensland Place Names. Queensland Government. Retrieved 27 August 2016. ^ Australian Bureau of Statistics (27 June 2017). "Nanango". 2016 Census QuickStats. Retrieved 4 April 2018. ^ a b "Nanango history". Nanango Tourist and Development Association. Archived from the original on 20 September 2016. Retrieved 27 August 2016. ^ "Whistlestop wines". Archived from the original on 1 February 2009. Retrieved 12 April 2018. ^ "Nanango War Memorial". Monument Australia. Archived from the original on 7 April 2014. Retrieved 5 April 2014. ^ "Social Gossip". The Queenslander. 14 February 1920. p. 9. Retrieved 6 April 2014 – via National Library of Australia. ^ "Public Libraries Statistical Bulletin 2016-17" (PDF). Public Libraries Connect. State Library of Queensland. November 2017. p. 15. Archived (PDF) from the original on 30 January 2018. Retrieved 30 January 2018. ^ Australian Bureau of Statistics (25 October 2007). "Nanango (Urban Centre/Locality)". 2006 Census QuickStats. Retrieved 27 March 2008. ^ "Nanango Butter Factory Building (entry 602525)". Queensland Heritage Register. Queensland Heritage Council. Retrieved 12 July 2013. ^ "Nanango Court House (entry 601571)". Queensland Heritage Register. Queensland Heritage Council. Retrieved 12 July 2013. ^ "NANANGO WILLS ST". Climate statistics for Australian locations. Bureau of Meteorology. March 2014. Retrieved 1 April 2014. ^ "Nanango Library". plconnect.slq.qld.gov.au. State Library of Queensland. Archived from the original on 22 January 2018. Retrieved 22 January 2018. ^ "South Burnett Grapes and Gourmet Trail". Archived from the original on 11 April 2018. Retrieved 12 April 2018. This page was last edited on 27 December 2018, at 05:34 (UTC).